Idli and Dosas are South Indian's staple breakfast. There are many kinds of Idlis and Dosas available. Today i am sharing with you a dosa recipe which does not require any fermentation and could be made instantly at any time. Yester day i have shared another no ferment dosa which is Neer Dosa recipe. It requires soaking of rice for about an hour. But this recipe does not even require that time. Quick and easy recipe. The dosas are really flavourful and crispy. 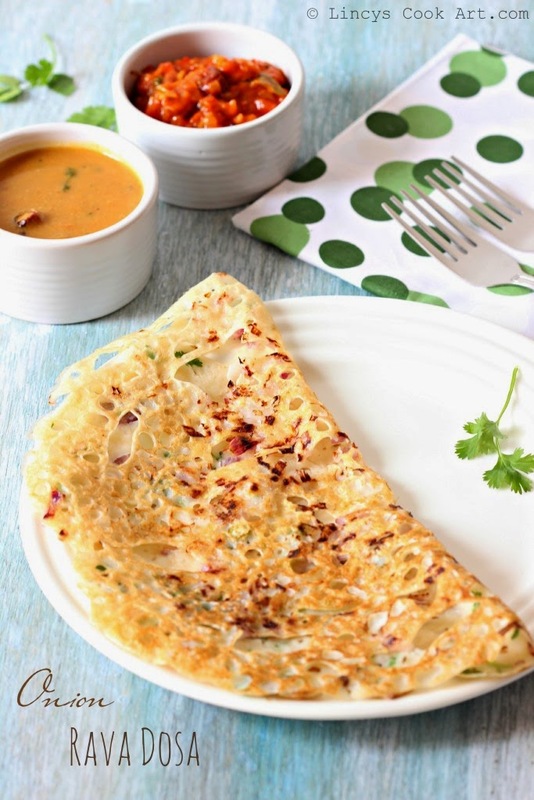 The browned onions adds more flavour and colour to this dosa. So fresh and rich in flavours and lace like crispy dosa. Hope you make this tasty dosa from today at home and does not order at restaurants any more. In a bowl add the chopped green chilli, ginger, cumin seeds, asafetida and coriander leaves. On top of that add the semolina, rice flour, all purpose flour and salt. Mix well with hand to uniformly combine well. Then add 3-4 cups of water to dilute the batter like very thin buttermilk consistency. Heat a dosa pan well and sprinkle little oil and then spread one hand full of onion evenly on top of hot tawa. Roughly pour the batter from the edge of the pan to the centre as shown in the picture. Fill any big gap if you found with little batter. While pouring you could hear the sizzling sound of the dosa batter and forming holes on the dosas indicating the right consistency of the batter. Drizzle some oil on top of the dosa and allow to cook on medium flame till the dosa's top turns slightly golden colour or the bottom turns deep brown. Fold the dosa and serve hot with Tiffin sambar or Tomato Thokku. Mix the batter well before pouring each dosa as the rava settles at the bottom of the batter. Note: Add extra water and salt if required after preparing some dosas to dilute the batter. Rava dosa takes longer time to cook than regular dosa. Heat of the tawa is very important to form holes in this dosa. My hubbys fav dosa...Just crisoy and amazing ..